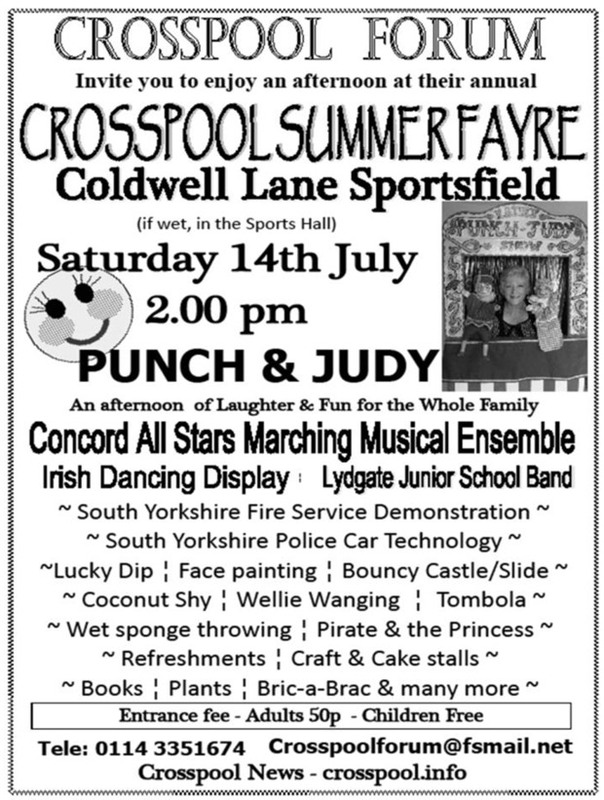 The third Crosspool Festival ran 7-15 July, 2012. The full programme is below and you can also download a PDF copy (676KB). The prize-winning cover designs are by Amelia Cocken, Lydgate Infant School [front] and Ines Reynolds, Lydgate Junior School [back]. We’d like to thank all the talented artists from both schools who entered. If you have any questions about the festival, please contact the organisers via St Columba’s church parish office (staffed mornings Tuesday-Friday) on st.columbas@hotmail.co.uk or 0114 267 0006. At 7pm outside the Crosspool Tavern, Rev Tim Bradshaw & Rev Frances Eccleston will dedicate the Crosspool floral display, created by local volunteers, where it will remain on view throughout the Festival week. Admission £4 by programme available in advance from Lounge@Crosspool or participating gardens, or on the day from Stephen Hill Methodist Church. All funds raised in aid of charities. Sat 7 July 7.30pm – Celebrate! Come and enjoy the traditional Hallam Day at Hallam Cricket Club, Sandygate Road on the afternoon of Sunday 8th July. There’s a Parent and Child pairs tournament (open entry on the day : child up to 11 and mum or dad,) a 6-a-side competition (mixed gender and age – teams made up from those who come on the day), stalls, a bouncy castle, plus barbecue and refreshments – cream teas – licensed bar available from 2pm-8pm. Come and join in. It’s a great family day out. Don’t miss it. Join 36th Sheffield Beaver Colony on a Treasure Hunt around Crosspool, suitable for children up to 8 accompanied by an adult : older children are welcome to come with you. Collect a map from the Scout Hut on Benty Lane between 6pm and 6.30pm, follow the map to gather the clues, and return to the Scout Hut by 7.15pm to collect your “Treasure”. Maps are £2 per family or £1 if any of the children in your group are in Beaver, Cub or Scout Uniform and necker (from any Scout Group). Refreshments are available at the Scout Hut until 7.30pm. In the Forum in Stephen Hill Church, 10.30 : Pre-school children are invited to bring young Mums (or Dads) for a Sing Song of your favourite Nursery Rhymes with Barbara Pye on the piano. A short evening stroll to admire the beautiful woods & meadows of Crosspool : leave Stephen Hill Church car-park at 7pm, for a fairly gentle guided walk in the company of local wildlife enthusiast, Roger Kite. with drinks provided at Stephen Hill from around 8.15pm. ‘Guys and Dolls’ is a vibrant, comical and romantic musical set in New York. Sky Masterson, the infamous gambler ends up falling for the cold Salvation Army girl Sarah Brown after a bet takes them to Havana. The production includes the famous show tunes ‘Luck be a Lady tonight’ and ‘Sit down you’re rocking the boat’. The cast of 50 showcases the talent of Tapton’s students. Tickets will be available from Tapton School in June – Wednesday 11 July. In the Forum in Stephen Hill Church, 10.30am. Roger Kite will have a film show of Old Views of Rivelin Valley to take you back down memory lane. at Stephen Hill Methodist Church 6–8pm. St Columba’s, Manchester Road, 7.30pm Free — retiring collection for Ryegate Children’s Centre Fund. Rhyme & Reason Books will have copies for sale. Wine will be served. In the Forum in Stephen Hill Church, 10.30am. Come and join a team or bring your own for a Quiz session with Trevor Wilson. In the cafe, Valleyside Garden Centre, Manchester Road, 1.30pm. Enjoy refreshments while you sort out your gardening problems with local expert Richard Jackson, who will answer your questions on all aspects of plants and their care. In the Forum in Stephen Hill Church, 10.30am. Lots of different Table Games. Try your hand at a jigsaw or Scrabble or many other Word or Card games. 2.30–5pm in the Oxford Hall at Stephen Hill Church. Dancing to records of a mix of Old Time and Modern Ballroom. £3 Ticket includes tea and biscuits. Lydgate Infant School, 5.30—8pm. Stalls, plants, games, a bouncy castle, fire engine, a marching band, second-hand books etc. 11am to 3pm on their allotments on Hagg Hill (look our for the new signs) To find out about the group, and join them working in the gardens. Includes the judging of the Hillside Challenge. Refreshments provided and all ages welcome. International harpist, Robin Ward, will be performing a programme that is an exploration of music, played on his own handcrafted triple harp. Robin’s programmes include a wide variety of music from the Baroque, Classical, and Romantic periods, as well as music from Folk Traditions, with a combination of Robin’s own transcriptions and music originally written for the instrument. Tapton Hill Congregational Church, Manchester Road Tickets £8/£5 concession, accompanied children up to 14, free : from Lounge@Crosspool or 230 8085. The four Crosspool/Sandygate Churches invite you to a picnic to mark the closing of the Crosspool Festival, in Lydgate Green, junction Lydgate Lane/Lydgate Hall Crescent at 12.30pm. Enjoy music from the Chapeltown Silver Band, and a brief address from Rev. Dr. Kon Apokis, Director of Training for Church Army. Bring your rugs, picnics and children! This is your chance to get involved with Crosspool’s major annual community event: if you can offer an hour or two to help, please contact St Columba’s church parish office on st.columbas@hotmail.co.uk or 0114 267 0006.